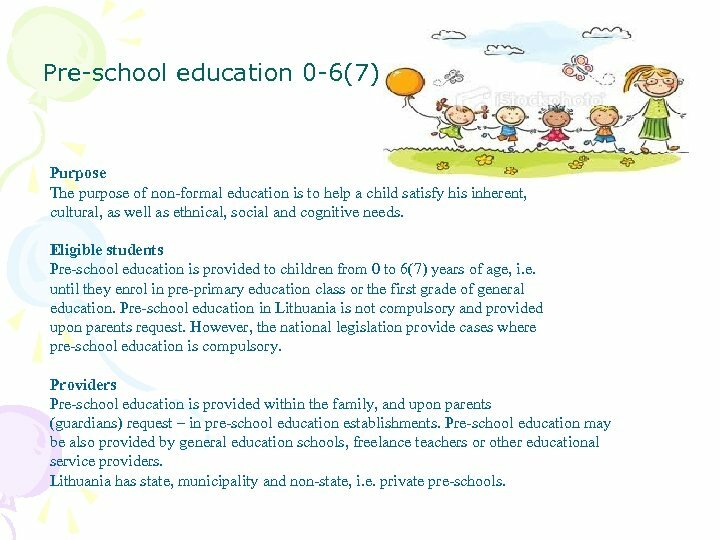 Pre-school education 0 -6(7) Purpose The purpose of non-formal education is to help a child satisfy his inherent, cultural, as well as ethnical, social and cognitive needs. Eligible students Pre-school education is provided to children from 0 to 6(7) years of age, i. e. until they enrol in pre-primary education class or the first grade of general education. 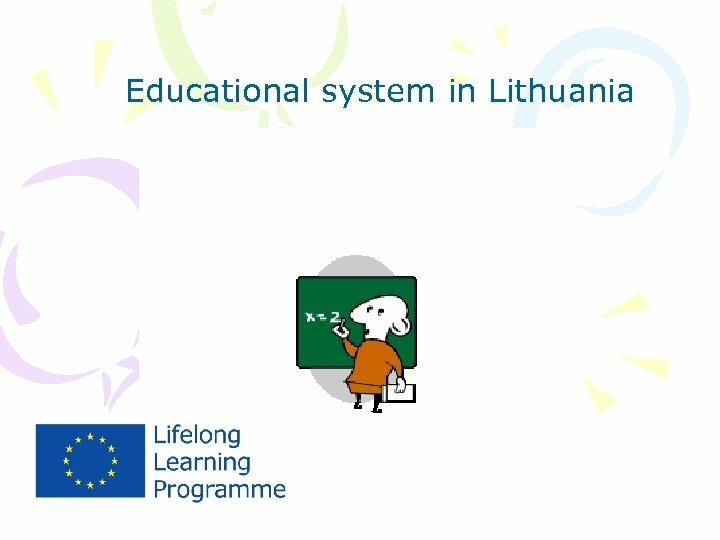 Pre-school education in Lithuania is not compulsory and provided upon parents request. However, the national legislation provide cases where pre-school education is compulsory. Providers Pre-school education is provided within the family, and upon parents (guardians) request – in pre-school education establishments. Pre-school education may be also provided by general education schools, freelance teachers or other educational service providers. Lithuania has state, municipality and non-state, i. e. private pre-schools. Pre-primary education 6(5)-7(6) Purpose Pre-primary education is a one-year long non-formal education programme aimed to prepare a child for primary school. Pre-primary education is not compulsory and may be chosen independently. Eligible students Children are admitted to pre-primary groups as of six years of age. In exceptional cases, upon proving the maturity of a child, five year old children may also be accepted to the pre-primary groups. Providers Pre-primary education is organized in a form of pre-primary groups. Schools may implement the programme in different ways (depending on duration, time, number of participants, and etc. ). 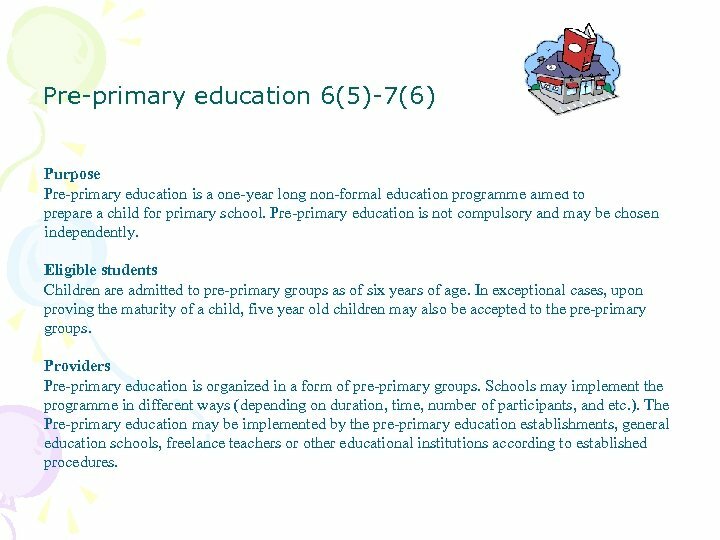 The Pre-primary education may be implemented by the pre-primary education establishments, general education schools, freelance teachers or other educational institutions according to established procedures. Primary education 7(6)-10 Purpose Primary education programmes are designed to educate an active and creative child, provide him with rudimentary literacy, social, cognitive, informational and operational skills and the foundations of shared values, as well as to prepare a child for studying under basic education programme. Eligible students A child starts attending the first grade in the calendar year when he attains the age of seven. Upon parents’ request, primary education may be provided at an earlier age provided that the child has achieved sufficient maturity. 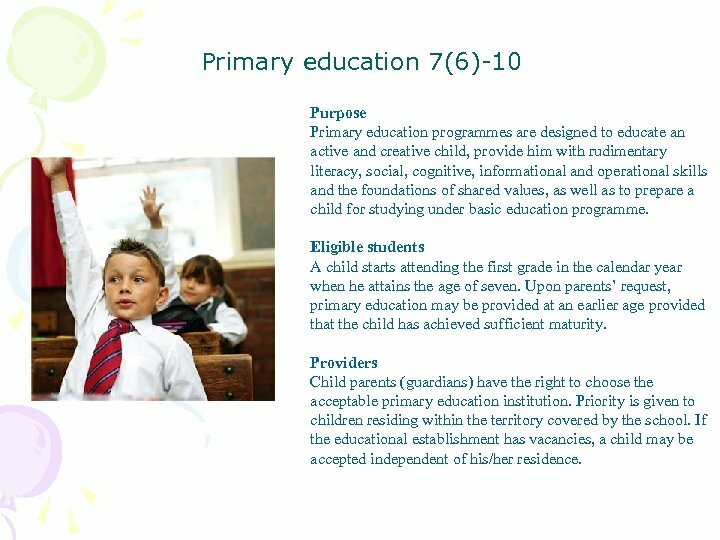 Providers Child parents (guardians) have the right to choose the acceptable primary education institution. Priority is given to children residing within the territory covered by the school. If the educational establishment has vacancies, a child may be accepted independent of his/her residence. Basic education 10(11)-16(17) Purpose The purpose of basic education is to provide an individual with basics of moral, socio-cultural and civic maturity, general academic literacy and the basics of technological literacy, as well as to develop national consciousness, the ability to achieve and make decisions, to choose and continue learning. Provision Children are accepted to state and municipality basic education schools under the principle of territoriality, i. e. priority is given to children residing within the territory covered by the school. If the school has vacancies, a child may be accepted upon parents request independently of his/her residence. 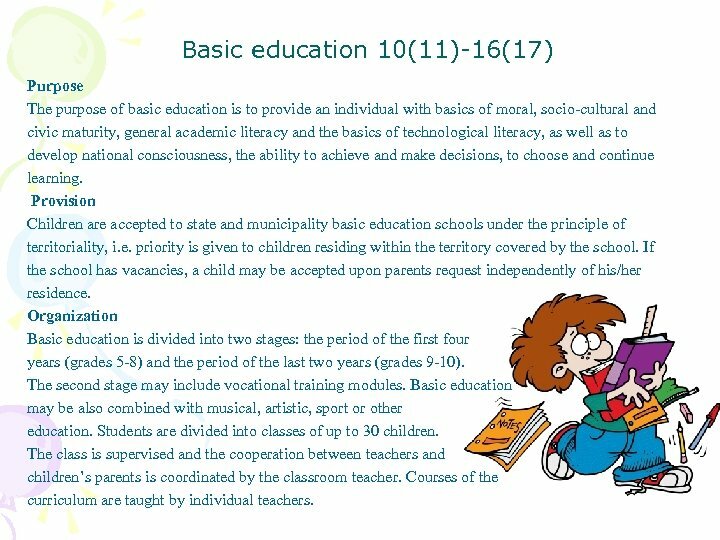 Organization Basic education is divided into two stages: the period of the first four years (grades 5 -8) and the period of the last two years (grades 9 -10). 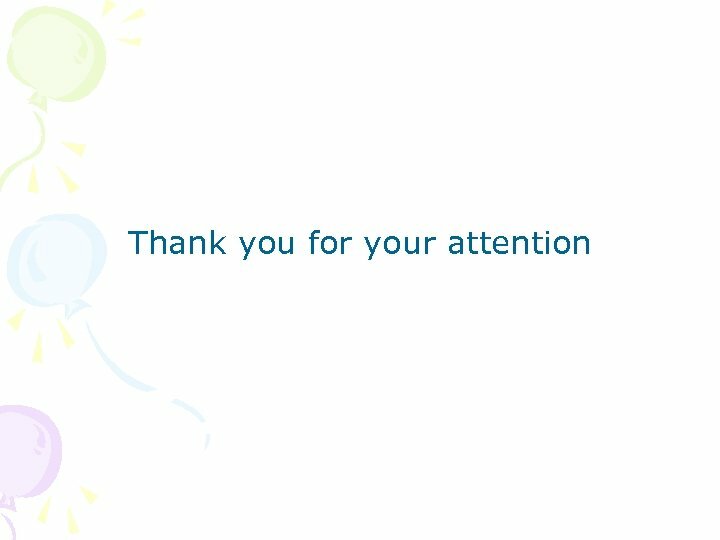 The second stage may include vocational training modules. Basic education may be also combined with musical, artistic, sport or other education. Students are divided into classes of up to 30 children. The class is supervised and the cooperation between teachers and children’s parents is coordinated by the classroom teacher. Courses of the curriculum are taught by individual teachers. 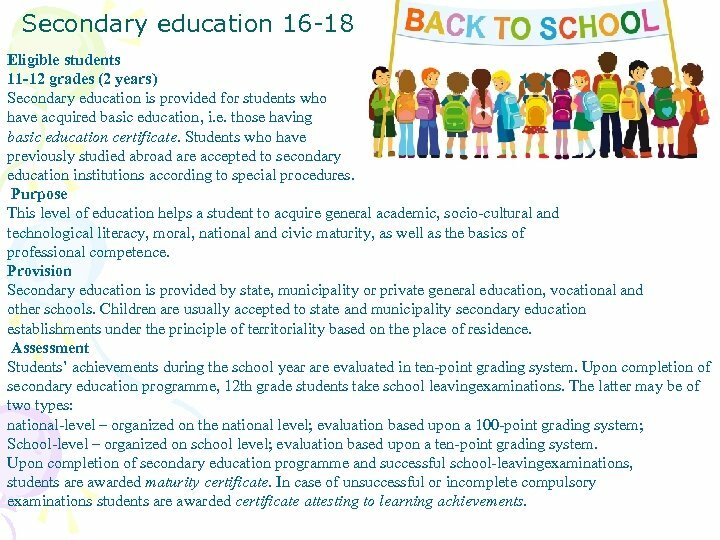 Secondary education 16 -18 Eligible students 11 -12 grades (2 years) Secondary education is provided for students who have acquired basic education, i. e. those having basic education certificate. Students who have previously studied abroad are accepted to secondary education institutions according to special procedures. Purpose This level of education helps a student to acquire general academic, socio-cultural and technological literacy, moral, national and civic maturity, as well as the basics of professional competence. Provision Secondary education is provided by state, municipality or private general education, vocational and other schools. Children are usually accepted to state and municipality secondary education establishments under the principle of territoriality based on the place of residence. Assessment Students’ achievements during the school year are evaluated in ten-point grading system. Upon completion of secondary education programme, 12 th grade students take school leavingexaminations. The latter may be of two types: national-level – organized on the national level; evaluation based upon a 100 -point grading system; School-level – organized on school level; evaluation based upon a ten-point grading system. Upon completion of secondary education programme and successful school-leavingexaminations, students are awarded maturity certificate. In case of unsuccessful or incomplete compulsory examinations students are awarded certificate attesting to learning achievements. Vocational education and training (from 14) Purpose The purpose of vocational education and training is to help and individual to obtain, change or improve vocational qualification and to help him settle and compete in the changing work environment. Eligible students Initial vocational training is provided for individuals who are at least 14 years old. Respective vocational training programmes are offered for individuals who have not yet acquired basic education, those who have basic or secondary education, and those who have studied under special education programmes. Continuing vocational education is provided for individuals who have already acquired vocational qualification. Organization School-based vocational training is organized in schools providing theoretical and practical training. Practical training may be organised both in school and a workplace under vocational training agreements with enterprises, institutions, organisations, farms or implemented by freelance teachers. Adult education 18 years and older Purpose The purpose of adult education is enable an individual to acquire general (primary, basic, secondary) education under formal education programmes (formal adult education) or to improve the already acquired qualification and gain additional competences through various non-formal education programmes (non-formal adult education). Eligible students All adults from 18 years old. 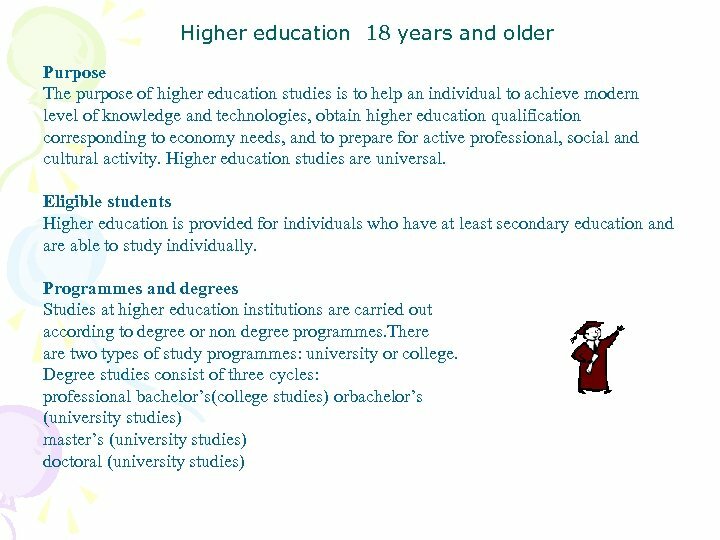 Provision Adults may study under formal education programmes in general education schools for adults, or in special classes of general education schools. 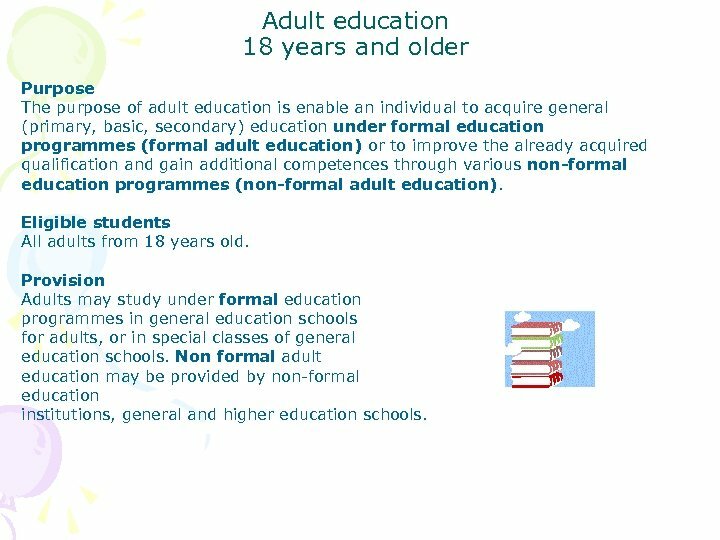 Non formal adult education may be provided by non-formal education institutions, general and higher education schools. 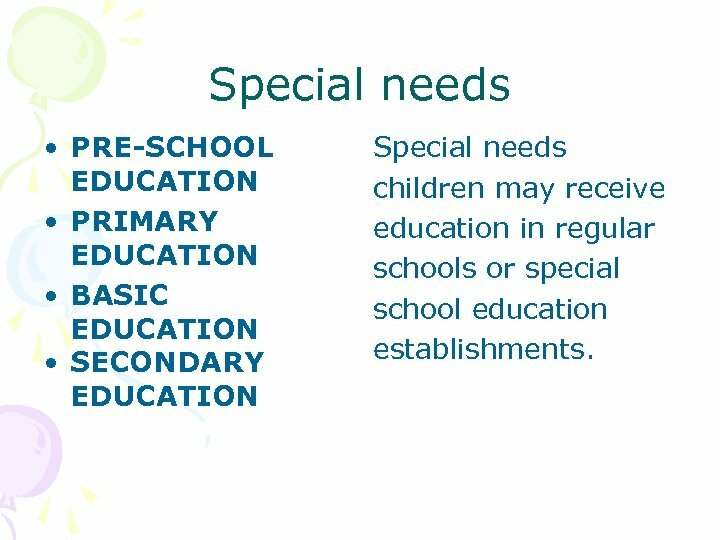 Special needs • PRE-SCHOOL EDUCATION • PRIMARY EDUCATION • BASIC EDUCATION • SECONDARY EDUCATION Special needs children may receive education in regular schools or special school education establishments.